T. B. & J. Richards. This founder's mark at 34 Water St. in downtown Manhattan might possibly be the oldest mark of its kind in New York City. The foundry T. B. & J. Richards was in business from approximately 1838 to 1875. They were located at 143, 145 and 147 Perry St. in the West Village, and the partners were Thomas B. Richards (ca.1789-1869) and James Richards (ca.1794-?). The partners might have been brothers, but I have not been able to establish this. They were both born in England, and were active in New York City from around 1830. They both appeared in the 1860 U. S. Census living in New York's Ward 9, District 4. At that time Thomas Richards was 71 years old and lived with his wife Sarah and son James J. Richards. James Richards was 67 years old and lived with his wife Henrietta and children, Alfred age 22 and Manna [?] age 18. Thomas B. Richards died in 1869. Directories list only James Richards after 1870. The following entry is found in the 1850 U. S. Census Non-Population Schedules, "T B & J Richards / Iron Foundry / Capital invested $30,000 / Raw Materials Used: 800 ? Iron, $16,000; 250 Coal, $1250 / Steam motive power / Average number of hands employed 35 / Average monthly cost of labor $1400 / Annual product: 800 Iron Castings? Consisting of Wheels, Shafts & General Machinery, value $45,000." This would seem to add up to annual costs of approximately $34,000 with sales of $45,000. 35 employees meant the works were of appreciable size, but not really huge. The 1870 Census Non-Population Schedules had the following entry, "Richards James / Iron Foundry / Capital $35,000 / Motive Power steam, 5 horse power / Average number of hands employed 20 males above 16 / Total wages during year $15,000 / Number of months in operation during the year 9 / Materials: Iron 400 tons value $5000; Coal 200 tons value $1000 / Production: Jobbing? Castings 400 tons value $35,000." James Richards, on his own in 1870, seems to be operating a somewhat more modest foundry than the earlier one in 1850. 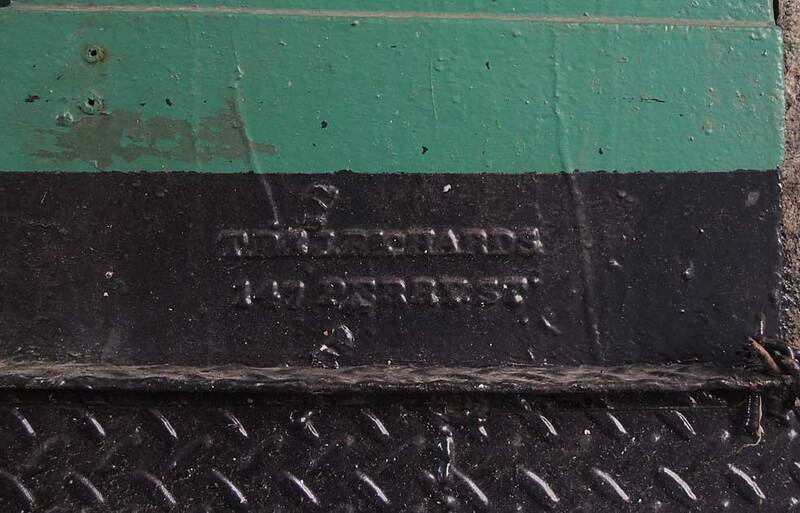 In 1875 the James Richards foundry at 145 Perry St. was taken over by Lewis Fink & Son. See the Fink Page for more of Lewis Fink Sr. and Jr.